Family-friendly 3-bedroom, 2.5 bath home with *heated pool and spa! Just a 3-minute walk to the beach and located in a quiet section of Palmetto Dunes, this home has everything you need for your next family vacation. A spacious great room with vaulted ceilings and comfortable furnishings welcome you. The updated kitchen with granite counters and stainless appliances opens to the dining area. The dining area has seating for 6 and is adjacent to a sitting room containing a queen sleeper sofa. This area leads out to the large deck and private pool area. The spacious backyard overlooks a large lagoon. The deck offers plenty of outdoor seating to enjoy the spectacular views. You will find the washer and dryer located behind the closet doors in the kitchen. Also on the main level is the powder room and 2 bedrooms. One bedroom with king bedding and one bedroom has 2 twin beds. These bedrooms share a full bath. Upstairs, on the 2nd level, is the spacious master bedroom with king bedding and en-suite bath. 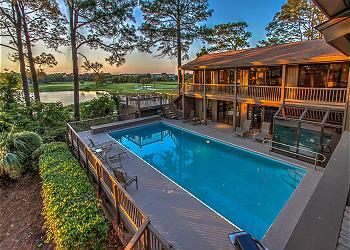 This lovely Palmetto Dunes home is perfect for your next vacation! •	Private *heated pool and spa (15 x 22 rectangle) *This pool & spa have a gas heater and can be heated for an additional fee of $575-$875 + tax per week depending on the season. If you would like to heat the spa only, the cost per week is $225 + tax. •	Garage is for owner use only. •	The fireplace is not for guests use due to liability issues.